The earliest tank design with a rotating turret, the miniscule, French "Renault FT-17" was exported to many countries as different variants. As early as 1919 the newly formed Finnish army received 32 pieces of the type, thus becoming one of the worlds first armoured forces. 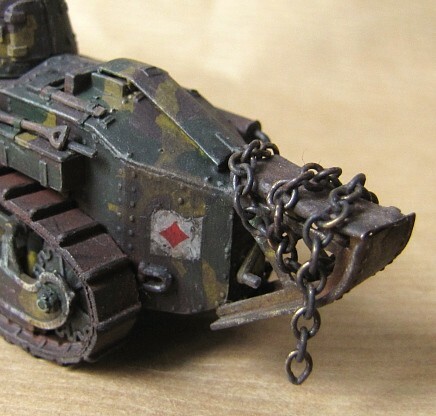 They were used in training until the late 1930´s, when most of them were dug in on the eastern front as static pill-boxes in anticipation of the war. A majority of FT-17s were lost to the Russians when the front line defences could not be held in the spring of 1940. At least one is preserved in the Parola tank museum. 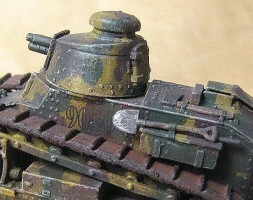 A nice picture of it is here http://www.someplaces.spb.ru/suomi/Parola/Images/Par_33.htm, (clicking the arrows below the picture lets you view other Parola tanks). Once the kit box is opened, a stunning multitude of parts is revealed. A closer inspection shows the detailing of the parts to be very good: rivets are present all around, the complex running gear sets are divided to several, very delicate parts - even the 2 mm wide return rollers are made of two halves, the armament is finely crafted, and so on. 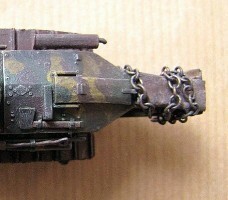 The modular production system of the kit allows several armament options to be available on the sprues, but not all turret parts are present in this boxing for these different variants (Finns had several variants of the FT-17 in use). There are also three alternative idler wheels available. Unfortunately, the molding (limited run technology?) ruins the delicate impression of the kit somewhat, as the thick sprue connectors make neat separation from the sprue difficult and even hide some details underneath them in some cases. The tracks are the weakest point of this kit, as they are thick, simplified rubber bands. The difference in their appearance between the spare track parts made of injected plastic is so clear, that at first it is difficult to recognize that they are supposed to represent the same thing. The kit comes with an admirably comprehensive decal sheet, with markings for amazing 15 different vehicles. 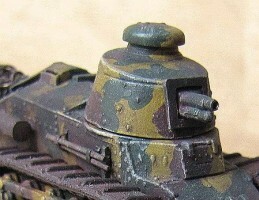 It even includes markings for one Finnish vehicle, which for me is a great, welcome bonus. The decals are joined together with a uniform carrier film, and have to be cut out and trimmed carefully. The decals are thin and the printing on them is crisp, if a bit faded. The instructions are informative and clearly drawn, but as for some smaller parts they do not make quite clear in which precise location and in which position they should be installed. Also, it is very annoying that the parts are not numbered on the sprues, but the modeller needs to refer to a part layout "map" on the instruction sheet. This task is made all the more tedious as there are several parts on the sprues that are not to be used with the variant that is in question here, and some parts seem to be numbered incorrectly. Once the assembly begins, some initial fears concerning the kit itself begin to realize. The fit of the hull parts at some points is not very good and some filling and sanding is needed. The hull does assemble rather neatly, though. Also the unusually brittle plastic material makes it almost impossible to remove the most delicate parts from the sprue intact. In fact, many of them had to be fixed with glue, and I, for instance, had to repair the rear axles twice. It would be advisable to substitute these particular parts with ones made of metal wire for better endurance. Considering the small size of the model, I regard the total amount and smallness of many of the parts as severe exaggeration. For instance, the 49 mm long left running gear will consist of 47 (must I say: microscopic) parts, the track excluded. The equally diminutive right set will be made up of 45 parts. Putting these together was the most nerve-wrecking experience for me with this kit. Okay, the outcome will be fine and superbly detailed, if the modeller has dexterous fingers, sharp tools and succeeds to keep his calm, but in this scale a far less complex part division would make more sense. 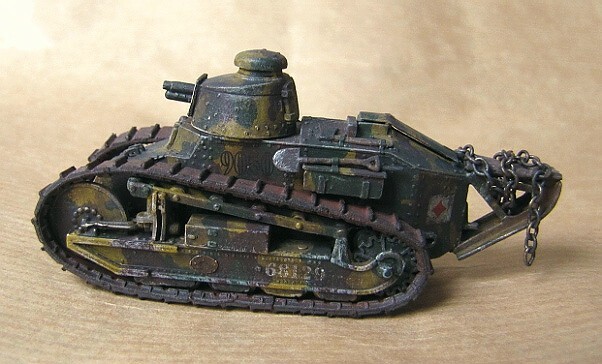 Something between this kit and the announced wargaming version of the FT-17 by Hät would do the trick for me. Happily, the farther the building process proceeds, the better the model starts to look. It finally appears that the kit can be built straight out of the box, all needed parts are present with the kit and there is little need to replace any parts with self-made ones, if not due to breakage... One could possibly consider replacing the front hatch handles with ones made out of thin metal wire, but I myself restricted to opening up the gun barrel, adding a tarp made of foil and a towing shackle plus repositioning and slightly modifying some of the tools. In addition, I cut an oval manufacturers plate out of foil to be installed on the lower left running gear. All in all, the FT-17 by RPM turns out to be a very complete little kit. Considering all the effort put in the designing of the model it is a surprising detail, then, that the exhaust pipe is upside down on the muffler. I also was left to wonder, whether the details on the running gear main side plates are correctly mirrored on each side. I thought it was necessary to build the kit in sub-assemblies. The running gear were put together and painted on both sides before installing them to the hull - careful aligning is important here. 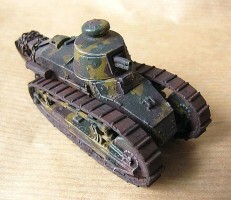 The final painting and weathering stages were then applied to the wholly assembled model. The Finns initially used their FT-17s in their original, elaborate French camouflage of mustard yellow, green and reddish brown. Later they were painted in khaki green, and also winter camouflage was sometimes applied. I recreated the 1920´s pattern with a mix of Tamiya XF-3 and XF-59 (yellow), XF-26 (green) and XF-10 (brown). Because of the small sharp colour edges and fine pattern this was done by brush. The kit decals were used per se, with the French originated playing card symbol "ace of diamonds". 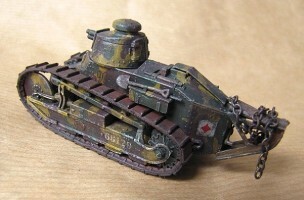 A highlighting with white, a black wash and a grey tinted satin varnish coating with some local pastel chalk treatments were given, and the model was ready for display. 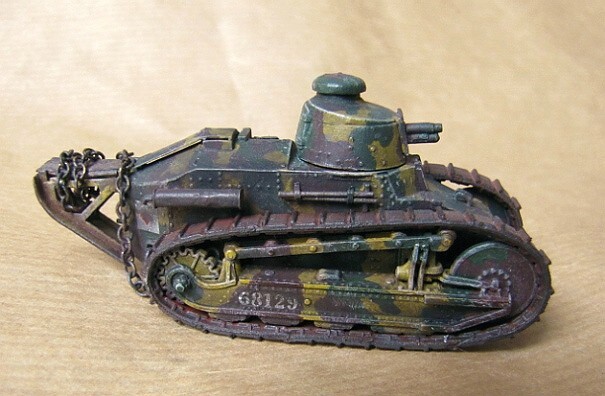 The RPM Renault FT-17 is a mixed bag. The choice of subject is excellent, and the strive towards product accuracy is admirable and ambitious. The first impression of the kit is very promising and the parts look good in the box. However, the building process reveals some problems with the material, molding and fit of the parts. Yet, if the build can be brought to a successful end, the outcome looks very accurate and detailed (apart from the tracks, which in the photos lack the final weathering). These features are enhanced by the sheer smallness of the finished model. But, if  as I believe  modelling is supposed to be relaxing and fun, this project did not meet that criterium thoroughly. I would recommend this RPM kit to only those surgically gifted modellers who have the nerves of a lamb and a flawless eyesight.